This is the first in a series of articles looking back at suits I have had made by the world’s major tailors, and examining their style through a consistent set of parameters and images. For background and context, see the introduction here. Richard Anderson cut me this three-piece, peak-lapel tuxedo in 2014. 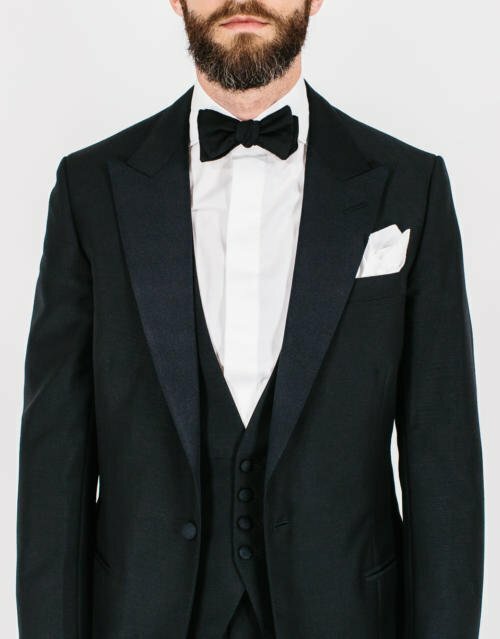 I really enjoyed talking with Richard, and particularly Brian [Lishak] about the style aspects of the tux. Although Richard’s output is always expanding, the atmosphere at 13 Savile Row remains cosy, with everything under Richard’s watchful eye. It is more similar in some ways to the Italian houses that are organised around a single master cutter, than to the other houses on the Row. For my tux I opted for a mohair/wool cloth, tempted by the sharpness of the mohair, and in black rather than the now more fashionable midnight blue. I don’t regret the black, and the mohair has remained crisp, but in retrospect I think I might have enjoyed a pure wool more. Mohair doesn’t have the same drape or age as nicely. Richard, of course, was at Huntsman for a long time, at the end as head cutter, and his style is similar to their classic cut. Compared to other English tailors, the style is perhaps best described as understated: straight up-and-down, without any exaggerated lines or sharp cutaways. The shoulder, for example, is relatively narrow, finishing before the outer edge of the deltoid muscle. The lapel is relatively narrow for a peak, at 3½ inches, and that peak fairly small. The gorge sits almost 5 inches from the shoulder seam, which average for Savile Row, but low by the standards of many contemporary suits. The quarters (below the waist button) are quite closed, and the hips cut neat. So Richard’s style is quite modest in that where another tailor might use some combination of extended shoulders, wide lapel and open quarters to create more of an ‘X’ shape across the body, he does not. The jacket’s shoulder has a moderate-sized pad (for an English tailor) and finishes quite naturally at the sleevehead, running smoothly into the sleeve and down the arm. Some tailors would try to create an impression of width here by using sleevehead roll (padding and often canvas) to lift up the top of the sleeve. The jacket is quite long (one of the longest I have, at 32¼ inches) which is consistent with the Huntsman style. 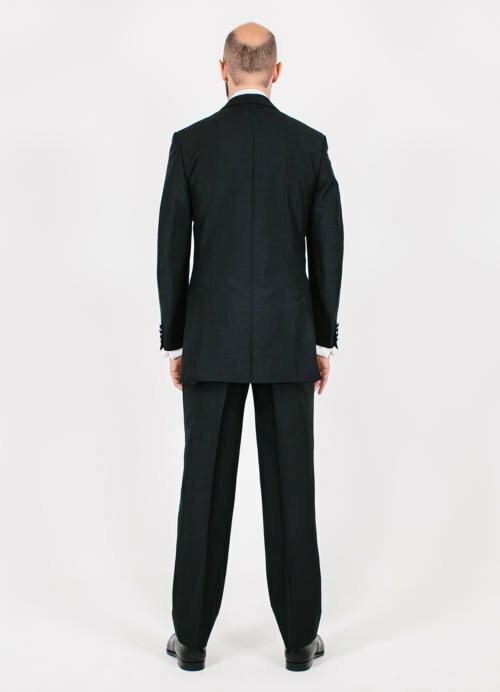 The buttoning point is quite low on the body, but normal in proportion to that length. Interestingly, the jacket has a little drape in the chest, although nothing approaching the tailors known for such drape, such as Anderson & Sheppard. Both these things could be used to give an impression of fullness or roundness to the chest. Elsewhere, not too much shape has been put through the back of the jacket. I have quite a hollow lower back, and tailors vary as to how far they want to highlight it. Richard kept it relatively hidden, with the back seam quite straight. The sleeve width is pretty standard, though the cuff is relatively narrow (11 inches). And the vent is a touch shorter than average (10 inches). In terms of make, the buttonholes are slim and neat – fairly standard for good West End suits – and the grosgrain facing (on the lapels) has been put on by hand. The work inside is also good and standard for the Row. Lining attached to the facings by hand, side seams in the lining by hand, centre seam by machine. In the chest there will be a layer of body canvas running the length of the body, a layer of horsehair just at the top, and then demette over the top of that. Jackets generally have two darts or cuts on either side at the front, to help create shape through the waist. Which of those they are, however, and which one (or neither) extends below the pocket to the bottom edge, varies considerably between tailors. Richard’s jacket has a front cut that runs all the way to the bottom (above – the line running through the pocket), and a dart behind it that runs from the armhole to the pocket. This is a little unusual for Savile Row tailors, who are more likely to have a dart or cut at the front that ends at the pocket, and a cut behind that that runs all the way to the bottom edge (creating a ‘side body’ between that cut and the side seam). As mentioned in the introduction to this series, I won’t comment on the style of the waistcoat (as there are hardly any to compare it to among my suits) and only mention the measurements of the trousers in the list below. Overall, I’ve been pleased with how my tux has worn. The only question mark for me is whether a more dramatic style might be more suited to evening wear. That is very much a matter of taste, however, and others might see this modest, understated style as perfect for something that – at heart – is meant to be elegant and simple: an accompaniment to any female companion, rather than a rival for attention. You can follow the discussion on Richard Anderson tuxedo: Style breakdown by entering your email address in the box below. You will then receive an email every time a new comment is added. These will also contain a link to a page where you can stop the alerts, and remove all of your related data from the site. Price (at the time of writing)… is that correct, its the price it would be today (given you’ve written this article today)? Having an updated price rather than 2014 is great but feels more onerous than saying what its price was at the time you had it made. Yes, it’s the price it would be today. It didn’t seem that relevant to quote the price from four years ago, given you can’t pay that any more! Would you ask Richard to change anything on the suit if you had it made today?I just wonder if your ideas on style have altered much over the years.For example,are you still happy with the jackets length or the width of the trousers bottoms,say 15″ today? I would probably narrow the trousers slightly, yes. I would leave the basics like jacket length the same, but I might ask for a slightly broader lapel perhaps – as mentioned, that’s very much a question of taste though. I would also generally say, as I always do, that you shouldn’t start trying to change the house style into something it’s not – eg trying to redraw the lapel, with more belly etc. Sleeves should be 1/2” longer. Right sleeve isn’t finished well at the back. More broadly, it’s a Tux on the other side of the pond. Here its a Dinner Jacket. I won’t address any of the fit points, because as stated many times, it’s not possible to make those kind of judgements based on photos like this. On terminology, you may well be on this side of the pond, but more readers are in the US. I’m happy to use the two interchangeably. I should also say that, as with everything I do, this series is not done by me in isolation. I chatted to tailors about all these suits. They suggested one or two alterations, but none of the ones you list. So I suggest we leave it to them rather than remote speculation. 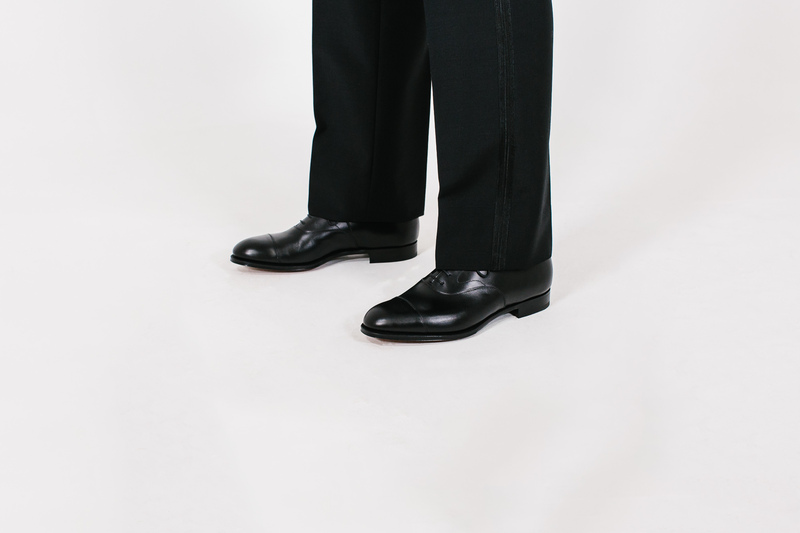 Was going to say, I always think Black Tie looks best with a slight military cut trouser – tapered and a slight angle at the hem. Thoughts? Interesting. Why more on black tie? Do you think it looks more formal? I think the trouser width is fine. Look at the side photo. Perfect fit. They just bellow out slightly sideways because of the way you’re standing. Perhaps they could be held up by braces. I find it gives a cleaner line down the crease. Otherwise, it’s a matter of personal taste. A question on prices. Why do you give a price and a starting price? Would the latter be the minimum price with the cheapest fabric? Beautiful but a heck of a price. 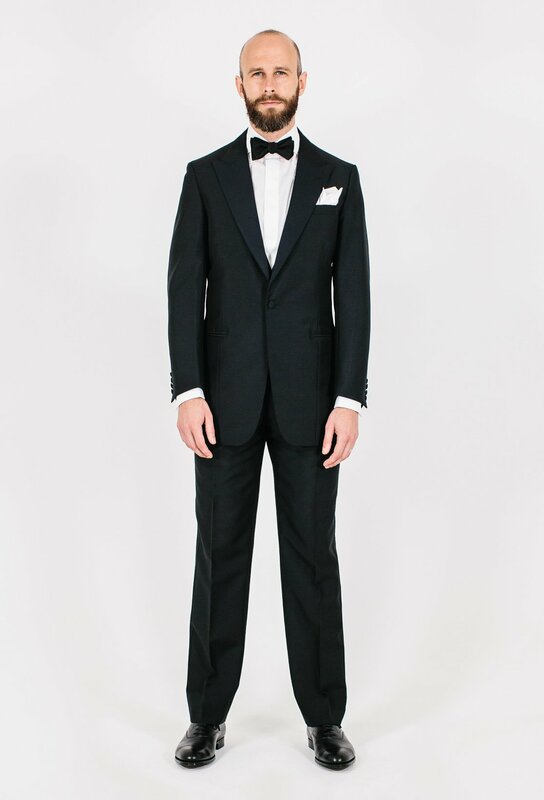 Apart from James Bond I can’t see many people getting the wear out of a tux that could justify such an outlay. I find the events at which I wear my dinner jacket are usually pretty warm. What weight cloth did you select? Does an X shape necessarily require extended shoulders? I have so far only considered the opening of the quarters , the shape of the opening of the lapel and the buttoning point. I find most traditional English tailors aim for a Y rather than an X unless asked to to otherwise. I like the pleats on the trousers; they look very well made. Final point, whilst it’s evident you don’t much like it when people are critical of something on this site, I think anonymous is pretty accurate with his comments on fit based on the pictures. For a cutter to see it and disagree with all my points so soon after I made them is impressively quick work Simon. Interesting. Traditionally a dinner jacket is ventless. Was the decision to cut a vent your choice, or was this Richard Anderson’s default? I really like the details of this suit. For a dinner jacket I would prefer a more dramatic cut since it’s one of the types of jackets where it works best, but I know this follow’s Anderson’s house style. Your desire for wider lapels would certainly give a more dramatic look. Interesting how you describe the peak lapel as being narrow, since it doesn’t look that way overall. By the measurement it sounds narrow, but the lapels look like a healthy width because the shoulders are narrow. The front dart extending to the bottom used to be more common with English tailors before the sidebody became popular. Now I rarely see it outside of Neapolitan tailors. How has mohair aged not as well as wool would have? I would really like a mohair-blend dinner suit because I mostly wear black tie in the summer (and I’m always too warm), but now I’m curious if 100% wool barathea is still the way to go. Good point on the relativity of the lapel Matt. The mohair seems to have shined up a bit, but the bigger point really is just that I dislike the way it feels a little. A bit too crisp if you know what I mean? The price quoted for a dinner suit is ludicrous. What is going on with price inflation in bespoke today? In the UK there’s barely been inflation and certainly no real wage increases in the last ten years. Yet bespoke (be it shirts or suits) increase over 10% a year. I wonder if a limit will be reached soon. No matter how good you income is, at some point spending so much on an item of clothing becomes absurd. And again this brings me back to GB. In the last ten years their price increases have been very small, barely keeping up with general inflation, yet they are based in London and should be exposed to a lot of the cost increases SR are. It would be interesting to see more from you reflecting on this. When ia enough enough when it come to prices? Thanks Simon. And that begs the question, when does it stop being worth paying for the insane rents at SR? Most (if not all) of the good cutters, with a very, but prominent exceptions, have retired anyways so it is not as if SR offers any advantage in cut as opposed to many other places. And interestingly John Kent, who is one of the last of the old guard, charges way less (as in several thousand pounds) for a suit / dinner suit than what is quoted here. And his / Terry Haste’s style would be very similar to this and handwork / make obviously the same. I think the price increasea not only relate to increased rent but availability of a new group of customer (Asians etc) who are more price insensitive. In addition the decline of the pounds vs major currencies allows for prices increases in sterling which seem less steep in say USD. Stees, which ia very US focused, have used this to raise their prices over 50% in the last few years. Will be interesting to see when this will stop. SR is clearly already “dead” to actual Britons. It’s not just rents or overheads. It’s much deeper. In today’s world, tailors want to increase profit margins. They needed to position themselves in the top-earning bracket and the world of easy money when they made the transition from craftsmen to artists/designers. You’ll be having a debate on the media and tailoring soon. I put it to you that social media and the iGent explosion have only made it worse. Customers want “design”, the tailor therefore becomes a designer, and charges designer prices. Thanks, that will be an interesting point to discuss. To be honest, my view is that Row tailors don’t think enough about design – nothing revolutionary, just small cut points. If you can afford to spend the thick end of £8,000 on a suit then average wage increases and inflation aren’t likely to have much of a baring on your income. Also remember that a substantial proportion, if not a majority, of the suits sold by Savile Row houses are being made for overseas customers, who will be completely unaffected by the sluggish performance of the UKs economy and are also benefitting from a more favourable exchange rates. I get what you mean about it being too crisp. It’s not going to feel as nice as 100% wool. But I love the way it looks here, though the trouser especially don’t drape as well as they would with wool. Do you know what the percentage of mohair in the fabric is? I think a bit of mohair in the mix is a good idea for a DJ as it adds the merest hint of a sheen, which I like. I agree though that 50/50 might be a little too much; 20% mohair is probably about right. Half mohair must be why it hasn’t worn as well. 15% mohair probably would be ideal, though it wouldn’t look as unique. This series will be a great reference work for years to come. Many thanks! An excellent start to what promises to be a really informative series. Your illustrated explanation of Richard’s house style plus the current pricing have certainly helped me slim down my shortlist! I think overall the suit is excellent. As regards the price, I don’t know how old you are but from your photographs I would thin that suit woul be good for another 20years. Edward Sexton made me a three piece dinner suit in 1983, very similar to yours, slightly wider lapels , 18 trouser bottoms, relatively timeless. I still wear it regularly, I prefer it my other dinner suits ,it’s nearly always commented on and I still am delighted to wear it. By the way, it’s Midnight Blue which in my opinion is the default colour for a dinner suit. Great start to this series. I’m really looking forward to other episodes. I have a summer tailor and an “everything else” tailor that I’m very happy with but it’s fun to compare styles. What’s your opinion on double breasted dinner jackets? Firstly thanks for taking the time to re-visit this selection. Great images too. I disagree with the comments re. the cut – it’s excellent as you would expect from Richard. My issue is more to do with style; it’s complex with idiosyncrasies that don’ quite chime. For example the double pleats vs. full leg, the waistcoat shape is uncertain; low gorge but with a v – rather than scooped. If it had been higher (sternum) the v would compliment the cut. I understand why it is cut this way (to match the jacket line) but why then use at all? Lastly, knowing your taste for restraint I understand the lack of silk facing on the lapel but it does look a little bare and therefore lacks synergy with the trousers (as, correctly, they have silk side braiding). None of this is really a problem but as time goes by and fashions change I question whether the hybrid approach will retain its style or look out of place. Personally I would consider some form of trim or facing on the lapels and get (if required) a new waistcoat cut. 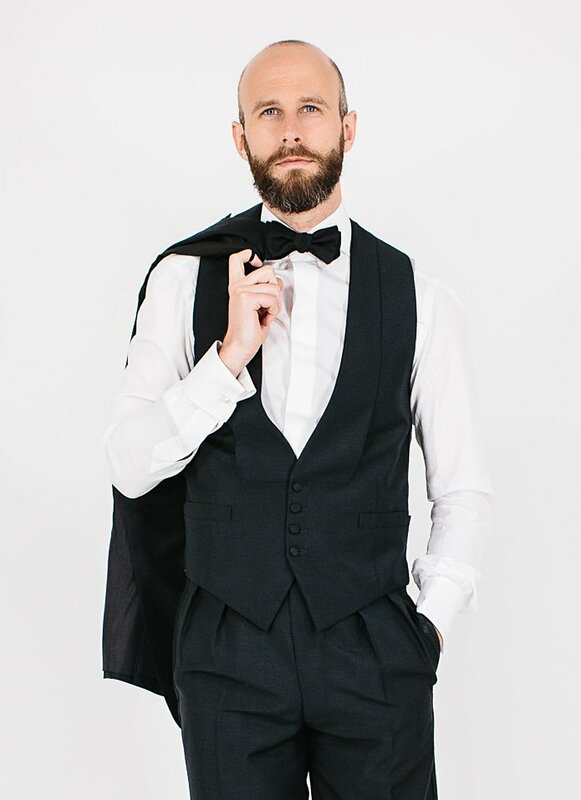 Keeping to classical styles in evening wear (peaked lapels and scooped waistcoat stylistically speak of 1920’s through to 1950’s) ensures greater longevity and thus greater value from the garment. I’m a bit confused at these comments because everything here is done by the book. The lapels on the jacket have silk facings, it’s just that the body has so much sheen that there’s not much contrast with the lapels. Or are you talking about the waistcoat lapels? Traditionally they may take the same facings as the jacket or may be self-faced (which is what they appear to be here). And the waistcoat is entirely traditional. The gently curved V-shape is just as traditional as the U-shape. A higher opening (there’s no gorge on the waistcoat because there is no collar) would not be traditional, since any waistcoat with black tie should be almost completely hidden with the jacket buttoned. Do the jacket lapels not have the grosgrain facing that you mentioned? Grosgrain would certainly look very subtle against a mohair suit. Beautiful lines, understated and completely flawless. You could wear this in twenty years time and it would still look this good. The epitome of ‘Permanent Style’. Don’t alter a thing. Cloth type is obviously a question of climate and choice. I‘m looking forward to this serie! It looks very promising and is certanly something that hasn‘t been done before on such a big scale. If you were a groom and would wear this in the evening, what would be your footwear of choice? Captoes as you wear it here, Wholecuts or Opera Pumps? Many thanks in advance. Well, I wouldn’t wear a tux for a wedding, but I know it’s more culturally appropriate in the US. I’d wear cap toes or wholecuts. This was a very interesting article, thank you. If I may pass on some feedback, I particularly valued your commentary around the “X” shape and what plays into that with this suit, the commentary around how some fullness in the chest is created. That commentary brought real value to the presentation of style points and measurements. Discussion of the side body, darts, and seams by contrast was curious, but the relevance of those was lost on me without commentary of how it impacts the fit or style. I would personally value having most measurements and style points linked into a broader commentary of the impression the suit makes. 1. As has been noted, the trousers have forward facing pleats. My sense is that with a tuxedo, one normally would have flat front trousers to maximize simplicity. Why were there foreword facing pleats? Is that Richard Anderson’s preference? Did you find that cut fit you better and so you requested it? 2. I could use some explanation of the round and belly. From your blog, you refer to the “cut” as creating it, so I’ve always assumed it had to do with how the outer edge of the lapel is shaped. But I’ve seen other sources seem to describe it as being how much the lapel stands away from the body (i.e. a function of the roll). Can you clarify this for me? Perhaps it is something work adding to the Introduction’s discussion of terminology? Thanks, and excited to see the rest of this series! 2. It’s the cut, rather than how it stands out or rolls. Sent you a posting but I don’t find it. Not to wear cap shoes with a Smoking. Slip on, pump or patinated please. Cap shoes is for business. Opera pumps on black tie, in this day and age, are a massive affectation. They’re fine for white tie. 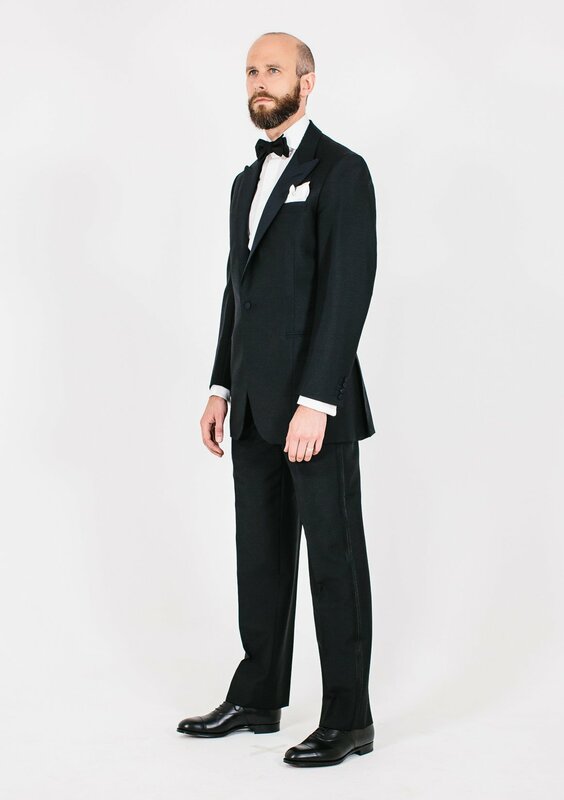 Pleats, particularly forward pleats, are a very traditional style for tuxedo trousers (well, since the 1930s). Trouser pleats are like darts on the front of a jacket; they’re ways of achieving a specific fit rather than to be an extraneous detail like unused buttons or pocket flaps. Regarding the waistcoat: how have you found the fit? I’ve normally seen waistcoats cut a little closer than this, although, you may not care to go jacketless anyway. You challenged my earlier point on fit saying you had discussed all aspects of fit with the cutter and concluded everything was fine. Now you say the waistcoat fit could be improved. No I didn’t… I said we had discussed all points of fit and he didn’t consider any of your points accurate. He had other suggestions. I’d be interested to know how much it cost in 2014. It does seem that Savile Row has a much higher rate of inflation than the elsewhere. Any idea why? What’s the fabric swatch? Dinner jacket looks great, well cut, and I understand the choice of mohair blend in black for weight and sheen. Smart choice. Photographs well. Bob (first comment) raises the issue of cost in 2014. Understandably, as you point out, we can’t go back in time but the point disregards the historical element of cost. Firstly, even in four years, styles have altered so a different cut might be considered – you would therefore be buying a different garment with different considerations. More importantly it provides a fixed reference point of cost as related to the exact garment not an imaginery new one (its like just referencing the cloth you would use now not the actual cloth used). It is understandable that you are providing up to date information but it is not really the point of the article is it? To properly proceed with this excellent catalogue exercise I believe it essential that the relevant detail is properly inventorised. If it were a classic car curation price new and current market value would both be listed. It might be that there is some background discomfort around price inflation but we are all adults and expect prices to rise (to a degree) – especially with the top houses. Lastly please don’t forget to write about the oft forgotten trousers – there is barely a mention until the comments wherein we realise that they come with braces (v. unusual for you as you will appreciate) and hence the double pleats. Thanks, I’ll certainly try to mention any trouser details. There’s just so much you could go into in a post like this. I guess my aim is to be comprehensive at the level of the style of the cut in the jacket – and then add other interesting points. I think the width of your trouser bottoms at just over 8″ is fine.There is,to my mind at least,a problem with trousers that shorten to 7.5″ and are meant to be worn with traditional shoes like Oxfords.A 7.5″ hem is too much of a contrast against a large English shoe.Much smaller Continental footwear sits more comfortably against very slim pants. I know this may sound odd but I think narrow hems and lightweight shoes like your Sagans are a classic pairing but conversely the same trousers with a heavier shoe will look out of date very soon when fashions change. I was surprised I didn’t like this more. Not that’s it’s a bad piece, not at all, but I had expected more of a flared coat (isn’t that the Huntsman style?) and for me the trousers should be flat fronted and cut a little closer (though Simon has set out his reasons for that). A DJ has to be pretty timeless to justify the low usage I think. I do quite like the low key facing on the coat lapels though, quite stealth. I’d love to get one but can’t justify the price as I’d hardly ever use it sadly. 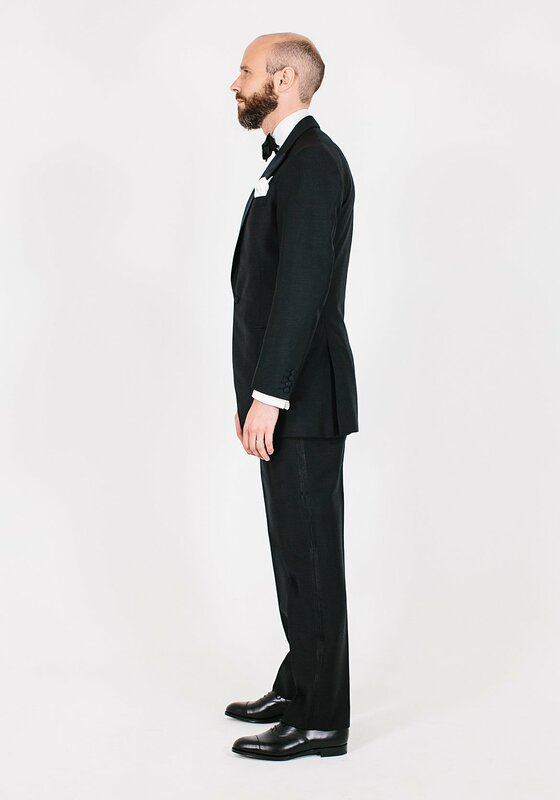 Simon – thanks for the review, and nice to finally see the RA tux in greater detail. I will echo your comment towards the end on opting for a more dramatic cut for a garment like the tux. I had a perfectly serviceable one made by Steed many years ago – while the end product looked good, I eventually decided a more dramatic and maximalist look would be better suited to a garment that’s made in neutral colors and is worn in the evening (in dim lighting where the finer points of tailoring are often not that evident). That thought led to a trek to Joe Morgan, and his more aggressively styled tux sits in stark (and, in my opinion, superior) contrast to the more sedate Steed. Fascinating discussion, I really appreciate the attention to detail, obviously it’s a worthy topic. In regard to the lapels, how do they compare with the sizing of the lapels on your Chittleborough & Morgan bespoke suit: width and gorge height? I think as a house style C&M they tend to exaggerate theirs so it would be nice to know the difference to get some perspective? Thanks! I’ll include that suit in an upcoming piece in the series, so a comparison will be possible then. But yes, they are at different ends of the spectrum! I just thought that the Chittleborough & Morgan suit would be interesting to compare to this, since they are both button one with peaked lapels. I’m very interested now to see how these two suits compare, and I’m glad to find now that I’m not the only one interested in this comparison. Any notable differences between this and the current Huntsman cut? It has been said that Richard Anderson is more Huntsman than Huntsman, since he was the last cutter who started from scratch apprenticing under Colin Hammick/Brian Hall. I believe no one from Huntsman currently ever even had flow through training from any Hammick disciples like Anderson and likely cuts their own interpretation of the iconic Hammick Huntsman cut. Regarding the tux, looks elegant though I am a bit surprised there isn’t more open quarters as I expected (same goes for the Huntsman tweed shooting jacket). I guess if one wants a specific cut, best to go with a particular cutter rather than the shop…Huntsman has so many cutters nowadays, with each one having certain variations to the house cut. Main reason why I went to Richard for a commission, you fairly know what you will get and no need to follow the cutter to various houses if he is the owner of the house! Though even his style has evolved from Hammick era. Thanks SC. In what ways? Mostly in the shoulder…less padding or “softer” than classic Hammick Huntsman. Though I believe most SR tailors have eased up on padding nowadays. Possibly a little less X shape also as the quarters appear to be a bit more closed and less skirt flare. I was reading an article in GQ about Prince Charles, included were some pictures of him wearing a double breasted dinner jacket. This particular jacket has turn back cuffs on the sleeves which I have never seen before on a dinner jacket. I’m not sure I like it, but it certainly adds interest. Is this something that used to be more common? Hi Simon – hope you’re well. 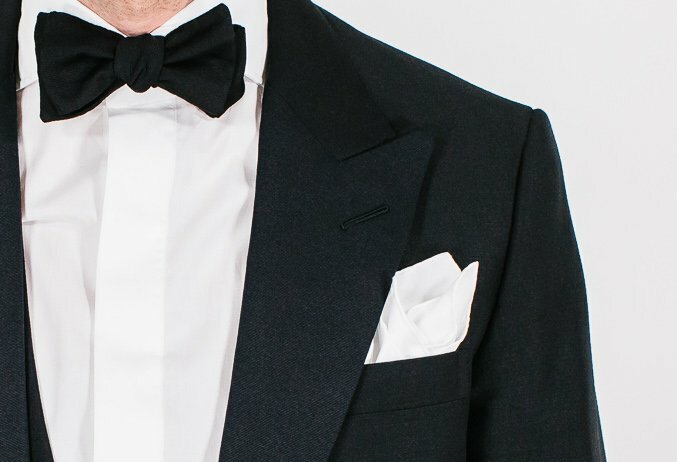 Quick question – what weight of wool do you think works best for an evening suit in order for it to drape best and last longest? Thanks. Simon – hope you’re well. A quick question in regard to waistcoat etiquette. It’s difficult to see for sure in the picture on this post and you didn’t discuss it much within the post – but does it matter if you have a collar on evening wear waistcoats or not? And if you do, do they have to match the jacket collar? For instance, with a peaked lapel jacket would a shawl lapel on a waistcoat not work at all? And why did you choose not to have one on yours? Many thanks. In general I would avoid a collar on a waistcoat on something like evening wear when you will rarely take the jacket off. It looks a little fussy and can cause this kind of issue with balancing that and the jacket. Any comment on jacket sleeve length? I notice in this series it varies somewhat from the prescribed 1/4″ to as much as almost 1 3/4″ or 2″ (hard to tell from photos). In some cases it also appears that the cuff is cut slightly higher in the front than in the rear. In this tux it appears to show roughly 1.5″ of cuff. 1/4″ in the Poole, and seemingly even more in the Huntsman tweed, tapering toward the rear. Do you have a preference? I normally prefer about a half inch. Most of these are around that, most the variety is just photography. Apologies if you have answered this question on a different post. 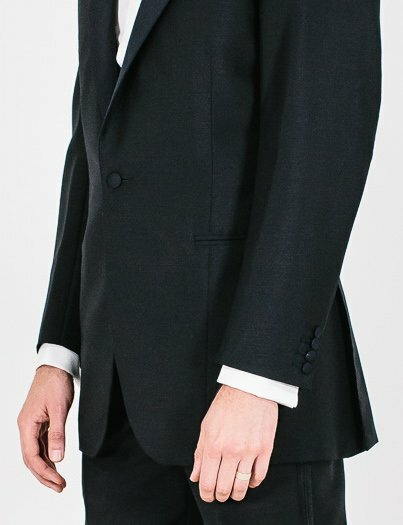 Would you recommend a double breasted jacket as part of the black tie ensemble ? Exactly my thoughts, Thanks Simon. It’s a good opportunity to wear a double breasted jacket. The EG “Chelsea” shoes that you are wearing are very elegant.Do you prefer calf to patent shoes with evening wear and if so why?Thank you. Yes, generally. Patent is just a layer of plastic on top of the shoe, and the texture has no richness or natural variation.